Bobrick B-5288 MatrixSeries Surface-Mounted Multi -Roll Toilet Tissue Dispenser high-impact ABS with high-gloss finish on exposed surfaces. Door is secured to mounting plate with two keyed pivots and a concealed locking device keyed like other Bobrick washroom accessories. Unit is equipped with a one-piece, dual toilet tissue spindle. 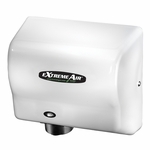 Unit dispenses two standard-core toilet tissue rolls up to 5-3/4" (145mm) diameter (2000 sheets). Extra roll shall be manually lowered into place when bottom roll is depleted. The degree of arc on the front of door and the radius on corners, edges and top of door shall complement other Bobrick MatrixSeries™ washroom accessories. Replacement part numbers shall be molded into unit.